COASTAL BERRIES! WE DO NOT HAVE MOUNTAIN BERRIES! IF YOU WANT MOUNTAIN BERRIES, PLEASE ORDER FROZEN. We have both at this time. Sold in 1 pound increments. 1 gallon is 5 lbs. 1 lb equals 1 1/2 Cups of Fresh Huckleberries, juice included. There will be juice in the bag because they are shipped at the peak of their ripeness. Strain the juice to use. Huckleberries are sweet and tart at the same time. The berries are more tart from the coast and smaller They sizes vary from region to region, as does the color. They are wonderful in a cobbler, in shakes, on ice cream and much more. Here is a link to recipes. They are our favorite berries. Frozen Huckleberries can be found here. Your huckleberries may be warm when you get them, it does not hurt them, just put them in the refrigerator upon arrival. Please use within 5 days or freeze them. Must ship fed ex priority overnight. There will be stems, but they are very tiny. Unfortunately, that is a problem we can't do anything about because when we try to remove them, the huckleberries fall apart. Huckleberries are very fragile. When you use the berries, the stems are very soft so they do not effect the quality. IF you notice any debris, just rinse the berries in a strainer gently. They are generally clean, but you may find some debris from the forest that may make it into the berries. We clean them as best as we can without ruining the berries. The more processed they are, the lower the quality. To freeze: place berries on a cookie sheet and when frozen, put in a freezer bag or a food saver bag. You can freeze them in a freezer bag. They will clump, but you can easily break them apart with a soft mallet. We recommend if you freeze them in a bag, that you only freeze them in small batches, so it saves you from having to break them apart when using them. Just put the bag in the refrigerator for a day to defrost. You can use the juice after straining it through a paper towel, coffee filter or any other cloth that is tightly woven. Huckleberries are associated with lowering cholesterol; protecting against heart diseases, muscular degeneration, glaucoma, varicose veins, and peptic ulcers. High in vitamin C, Huckleberries protect the body against immune deficiencies, cardiovascular diseases, prenatal health problems, and eye diseases. An excellent source of vitamin A and B, huckleberries are great for promoting a healthy metabolism which in turn helps reduce the risk of stroke. They are also known to help stave off macular degeneration as well as viruses and bacteria. Huckleberries are an excellent source of iron which helps build new red blood cells and helps fatigue associated with iron deficiency. 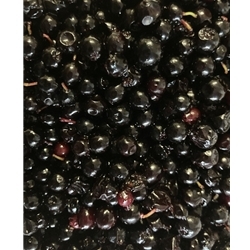 The huckleberry ensures proper functioning of nerve and muscle tissues, such as the heart and skeletal muscles, due to its high content of potassium. It also helps regulate water balance and eliminate waste.